CS Professional Verification Of Marks : Company Secretary had gained a lot of fame in the recent time and is becoming popular day by day amongst the students as one of the good career option. Many of the students they have been thinking to make a career in the CS field. After CA and CMA, CS is the next choice of career these days. Company Secretary is a professional who looks after the legal matters and disputes of the companies. He is the professional who practice the corporate law. To pursue a CS a student who has completed their 12th or Graduation degree from any of the stream i.e Commerce, Arts or Science except Fine Arts can apply for the CS course. If you are applying for the course after 12th than you have to give a CS Foundation exam. After clearing the Foundation exam you get eligible for the CS Executive exam and after that for the CS Final exam. If you are applying for the CS course after Graduation than you directly can give the CS Executive exam. A student also needs to under go with the Internship . The duration of the Internship differs on the basis of the stage of your CS course. If you have not cleared CS Executive and go for the internship its duration is of three years and on clearing the CS executive the duration of the internship is of two years and after CS Final course it is of one year. Where as you also need to do the other necessary trainings as prescribed by the ICSI institute. With CS if you also pursue the Law degree i.e LLB than you will have the good career opportunities and most of the companies they ask for the students to have the Law degree also along with the CS qualification. CS Professional Verification Of Marks : After Finishing June 2017 CS Professional Exams. When ICSI Announcing result than we will update here. Verification of Marks of Company Secretaries Examinations, The Institute of company secretaries of india declared CS Results 2017 on today 25th February 2017 and many students are not satisfied with there results so here we are providing detailed procedure for how to apply for Verification of Marks for CS Dec 2016 Exams. Here you get all latest updates for CS Verification of Marks, Form, Procedure For December 2016. ICSI Provide Facility for CS Verification of marks Form, Procedure all details. Recently CS Executive Result Dec 2016 and CS Professional Dec 2016 Result is Declared and After Providing CS Result Updates like Toppers list, Merit List, First Ranker Mark Sheet etc. In terms of Regulation 46 (2) of the Company Secretaries Regulations, 1982, as in force, a candidate can seek “Verification of Marks” in any subject(s) of CS examination within 30 days from the date of declaration of results. The interested candidates can apply for verification of marks either through on-line or off-line mode as per prescribed procedure with requisite fee @ ₹250 per subject. CS Professional Verification Of Marks : In case any candidate wishes to apply for Verification of Marks through off-line mode, he/she can download the Application Form available on the website and send the same duly filled in along with the requisite fee through Speed/Registered Post. CS Professional Verification Of Marks : Candidates may note that the response time for disposal of application for verification of marks is normally two months from the date of confirmation of receipt of online application by the Directorate of Examinations of the Institute. 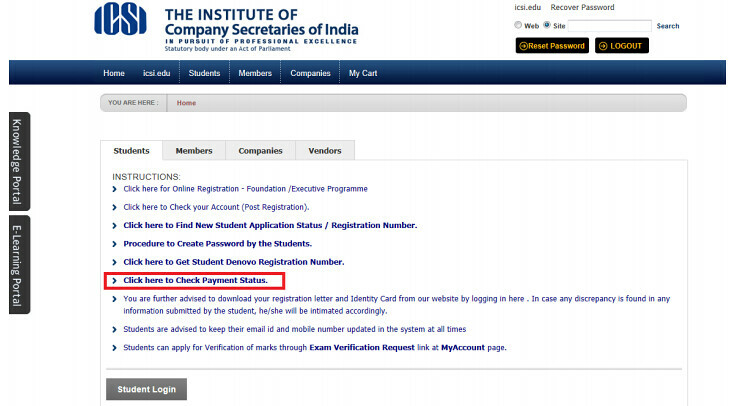 On receipt of the application for verification of marks, the status/outcome will be shown on the Institute’s website: www.icsi.edu The candidate concerned can enquire about the status/outcome of his/her application by entering his/her Roll No. or Student Registration Number. CS Professional Verification Of Marks : The application for verification of marks duly completed in all respects should be super-scribed “Application for Verification of Marks” and sent within one month from the date of declaration of results, addressed to The Joint Secretary (Exams. ), The Institute of Company Secretaries of India, C-37, Sector 62, Institutional Area, NOIDA – 201 309 (U.P.). Candidates can also submit their applications at Regional/Chapter/Head Office (Noida). Candidates in their own interest are advised to send the application by Speed/Registered Post or Courier to ensure the receipt of the same at the Institute and may keep the photocopy of the application and demand draft/receipt of application fee for future reference, if any. Further, they are advised not to club any other query/matter or remittance of fees along with their application for Verification of Marks to facilitate an early reply. If the student has applied simultaneously for Verification of Marks and Certified Copy (ies), the details should be provided in the form by ticking the appropriate choice. CS Professional Verification Of Marks : The response time to candidates’ requests for verification of marks is normally two months from the date of receipt of their applications complete in all respects in the Directorate of Examinations of the Institute. 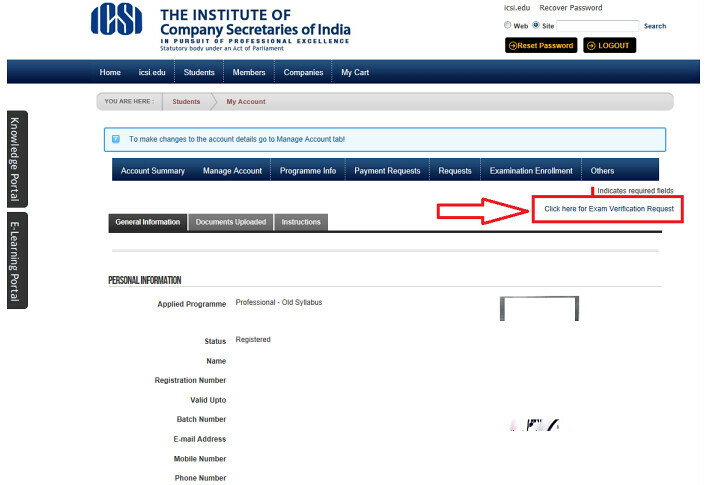 On receipt of the applications in the Directorate of Examinations, the status/outcome of verification of marks will be shown on the Institute’s website: www.icsi.edu and the candidate concerned can enquire about the status/outcome of his/her application by entering his/her Roll No. or Student Registration Number. In case of no change in his/her marks or result position the candidate can also download a copy of the reply letter instantly from the link given to this effect and no other communication will be sent in this regard. However, in case of any change/revision in marks in any subject(s) and/or result of a particular Module/Stage of Examination, separate communication to that effect will be sent to the candidate concerned through Speed Post. However, if a candidate does not receive any information from the website/communication within sixty days from the date of dispatch of application he/she may send an e-mail at: exam@icsi.edu or write to the Joint Secretary (Exams.) giving relevant details along with the scanned/photo copy of application and demand draft/receipt of application fee. CS Professional Verification Of Marks : The Institute of Company Secretaries of India (ICSI) has announced the timetable for Company Secretaries (CS) Examinations scheduled to be held in June, 2017. Accordingly, the next CS exam for Professional Programme Examination will be held from 1st June, 2017 to 10th June, 2017. The examination for CS Final (Professional) Programme June 2017 session of exams are scheduled to be held from 9:00 A.M. to 12:00 Noon.